The muppet's name is Cody. Because of course it is. 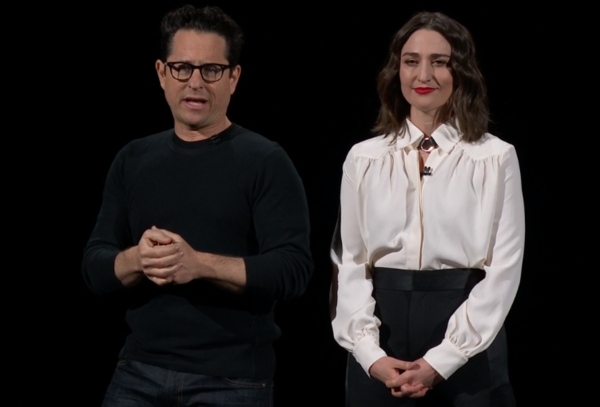 JJ Abrams is out now with Sara Bareilles to talk about their show together about singer-songwriting. Little Voice is a funny romantic show about what is hard, wonderful, and transformative, about being a young singer-songwriter. 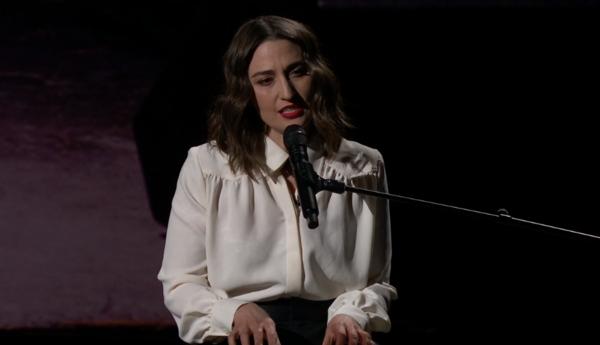 And Sara now signs us a song at the piano. 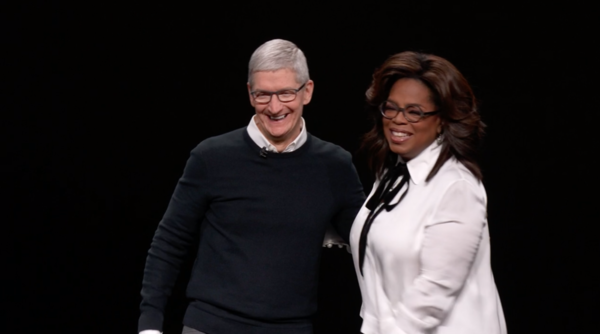 We partnered with the most accomplished storytellers and new voices to define tv+ to inspire us, make us laugh, make us believe anything is possible. 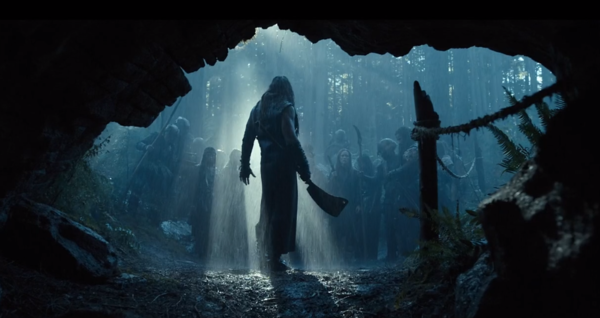 The highest quality of storytelling in one place. 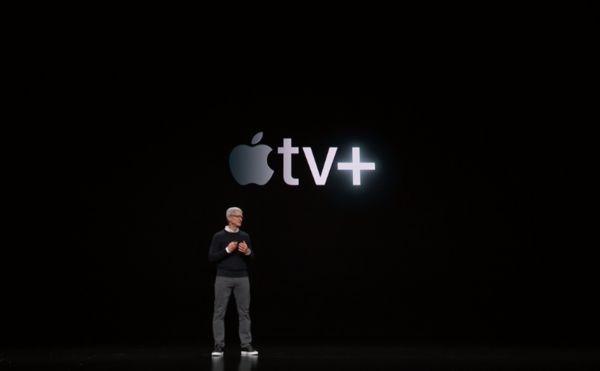 This is tv+. And a video plays from Morning Show. It's not just another streaming service. It's where the world's best storytellers bring their ideas to life on the TV app. Tim is back out. 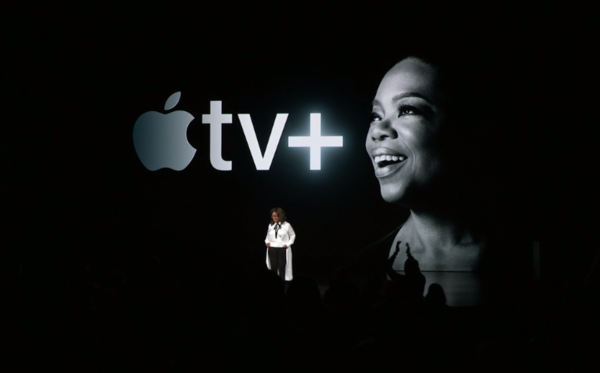 tv+ plus looks incredible, and we think it will encourage new ways of looking at the world. The opportunity to work with these artists is inspiring. Each will bring their own unique perspective to the stories they tell. optimism. inclusion. to find common ground. a voice that when amplified reminds us how much ideas matter. how much conversation matters. how much community matters. 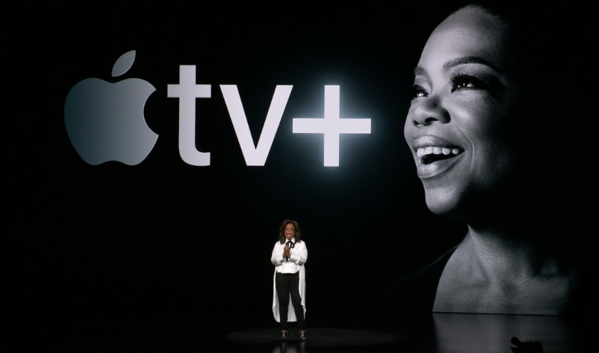 Oprah is on stage. The audience is standing for her. Oprah: "We have this unique opportunity to rise to our best selves in how we use and choose to use both our technology and our humanity. We're all at a crossroads where we get to decide if we want to reach beyond the borders of our hearts and minds to face the daunting challenges of our time. Each of us comes to this earth with a deep potential that yearns to be set free. We all crave connection. To seek common ground. We want to be heard, but we need to listen. We need to be open in order to contribute and harness our hopes and dreams to hear our divisions. That's why I have joined forces with Apple. Because they're the company that has reimagined how we communicate. 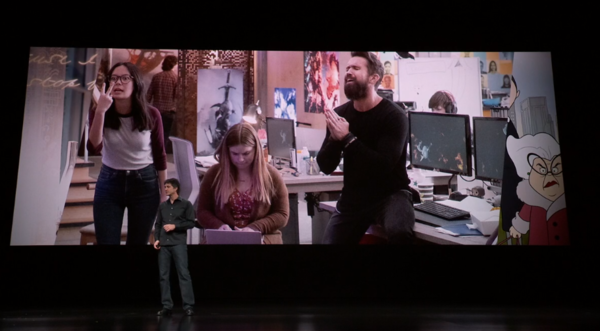 I joined in order to serve this moment, because the Apple platform allows me to do what I do in a whole new way. Because they are in a billion pockets, y'all, a billion pockets. So I am honored and proud to be a part of this new platform to connect with people around the world to create positive change. I have two documentaries in the works. One is on sexual harassment in the workplace, and the other is on mental health. "What I know is, if we do our jobs right, we will replace shame, we will replace stigma, with honesty." There's nothing more thrilling than being transported by a book, and we're going to do that by building the biggest most vibrant stimulating book club on the planet. Where Apple can stream a conversation with the author across borders to every man woman and child who looks up at the same sky. A meeting of the minds connecting us through books. Tim is crying a little, and smiles, saying, "thank you Oprah, I will never forget this." Tim sums up, "we are so humbled to work with them, and we can't wait to hear the incredible stories they're going to tell. from everything we've shared with you, you can see how these experiences are so important to us and help take our customers even further. At Apple, the customer has always been, and always is, at the center of everything we do." They've sacrificed a lot to get us to this day, and I sincerely thank you. It's amazing the privilege of a lifetime that I have to be able to work with you. I want to thank everyone for coming, the artists, and everyone watching, our customers. Thank you! And with that, it's over. Keep reading AppleInsider for more coverage on the event!